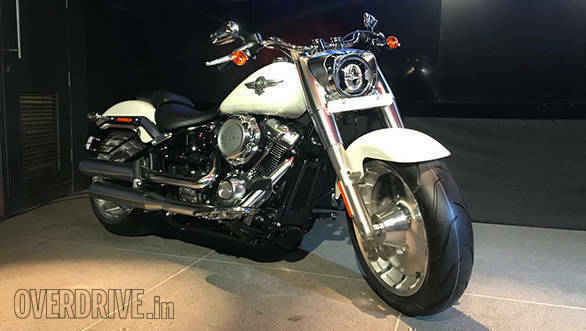 Harley-Davidson India has launched its all-new 2018 Softail family of cruiser motorcycles in India. Motorcycles launched include the 2018 Harley-Davidson Fat Boy, the 2018 Fat Bob, 2018 Street Bob and the 2018 Heritage Softail Classic. The Fat Boy is priced at Rs. 17.49 lakh, the Fat Bob at Rs 13.99 lakh, the Street Bob at Rs 11.99 lakh while the Heritage Softail Classic retails at Rs 18.99 lakh. All prices are ex-showroom India. 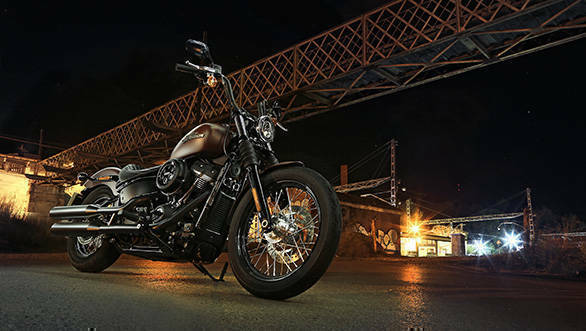 Interestingly, the Fat Bob and Street Bob earlier belonged to the Dyna family of motorcycles from Harley-Davidson, but the Dyna family has now been discontinued and both motorcycles are now part of the Softail family which already includes the Fat Boy and Heritage Softail Classic. Common to all four motorcycles launched is Harley-Davidson's 107 engine that's a part of the Milwaukee 8 series of engines. The liquid-cooled motor displaced 1750cc, or as the name suggests, 107 cubic inches. Peak torque output now stands at a healthy 150Nm, and Harley-Davidson is claiming quicker 0-100kmph and in-gear acceleration times for all motorcycles. All four motorcycles also get new underpinnings, including a lighter, stiffer chassis. 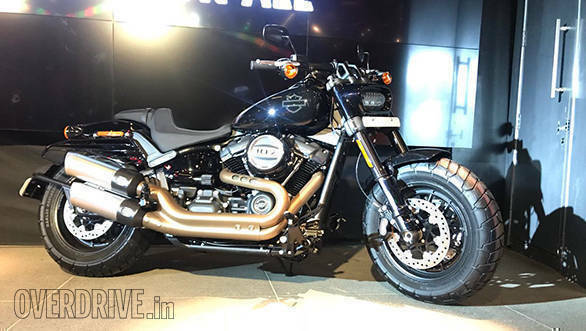 Harley claims the frame is 34 percent stiffer than last year's model which means a substantial improvement in handling, and also better lean angles on some of the models courtesy revised footpegs positioning and new exhaust designs. The swingarms on the bikes are also 7 to 9kg lighter. In fact, the Softails are now lighter by up to 15kg which should aid handling further. The 2018 Softail family also gets new suspension at both ends, including Showa's Dual Bending Valve Forks for more progressive damping and a new Showa monoshock at the rear to offer a more pliant ride. The monoshock now also offers preload adjustment. While the Fat Boy has traditionally been one of the most popular Harley-Davidson with its kind of design and stance, the 2018 Fat Bob seems poised to surpass the Fat Boy with the new model change. The 2018 Fat Bob gets a design that's far more aggressive and futuristic than before, particularly from the front. 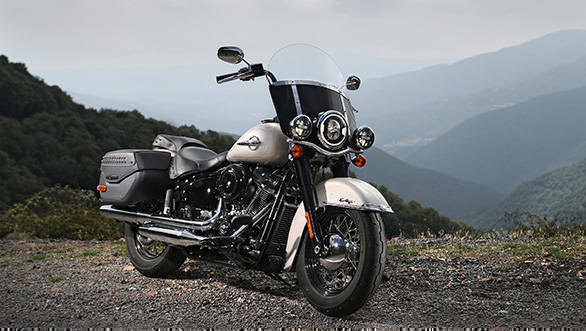 The more touring focused Heritage Softail Classic now gets a set of lockable, waterproof, hard panniers, a detachable windscreen and bigger suspension with a higher load rating. 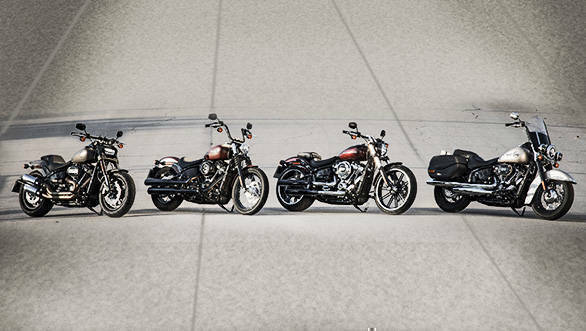 Common to all four motorcycles are Harley-Davidson's new Daymaker Signature LED headlamps. As the name suggests, these lights are bright enough to literally turn the night into day. All models also get new instrument clusters along with USB ports and keyless ignition as standard, which in a way completed the modernisation of what is easily Harley-Davidson's most popular family of cruisers.